Like some of the best cable brands, Allnic knows the secret of elegant packaging. Each interconnect and power cord cable is packed in a thick resealable plastic bag, which is itself supplied in a black velveteen bag with nice gold ferrules on the drawstrings and the Allnic logo in gold. 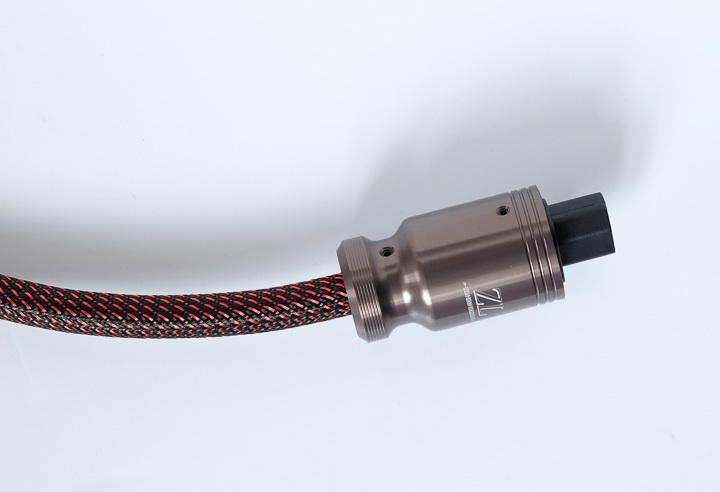 Meanwhile, the loudspeaker cable is housed in a thick silvery/gunmetal presentation case. OK, so Louis Vuitton it ain’t, but it’s a nice attempt to make these very good looking cables look just as good when you take them out of the box. They also have a blue cling-film attached to the speaker cable barrels and the plugs. This can be ‘fun’ to remove! The cables themselves are extremely well made, elegant, and quite difficult to manhandle. They have a habit of springing back into shape when you are trying to set them up, and it’s so hard to find a good cable-wrangler these days. Fortunately, Allnic gave the cables some very thorough burn in treatment before sending them to us. I was impressed from the first moment I plugged the cables into a system. I then tried them on another system and came away equally impressed. They are impressive for two very clear reasons. First, they do no harm. Sounds are portrayed not just with intrinsic neutrality, but fidelity to the performance of the electronics and loudspeakers you use. As I moved from a small British amp to big American muscle, so the Allnic cables brought out their inherent characteristics without over-stressing another aspect of the performance. It was easy to hear a step in the right direction relative to the product. In other words, a Naim amp didn’t suddenly become more Krell-like, or vice versa. Instead, it was like the Allnic read the thoughts of the device and made it perform a bit better in the ways it always wanted to be better. If I am going to pin-point products they shine with, it’s definitely on the more valve-based models (not unsurprising, as Allnic makes valve amps). The absence of its own imposition on electronics seems to be more attractive when it’s a valve amp playing. Which leads me to the other clear reason why these cables are so sublime... absence of background noise. OK, so audio’s Angry Brigade are sharpening their pitchforks as I write this, but cables can contribute to lowering the noise floor of a system. The mechanism as to how this happens is unclear, but they do it all the same. On a valve amplifier there’s less ‘tube rush’, on a solid-state amplifier there’s less hash, and on a digital audio device there seems to be a more focused, quieter sound. This was extremely consistent and applied universally. I’d like to try this in some of the more audio inhospitable places, like under the giant BBC transmitter in Wrotham. I think it might work! Of the range of Allnic cables, the interconnect and power cord (in that order) are best at this noise-killing effect. The speaker cable doesn’t lag behind, and has the same ‘integrity’ performance, but its noise-reduction properties are less pronounced than the other two cables. Not by much, it must be said. Fidelity and noise aside, I found the cables had a remarkably consistent performance, and that lends itself to a full set of Allnics from front to back. They are remarkably well made, and that doesn’t just come across in their build quality, it comes over in the sound itself. By effectively minimising the number of interfaces within the cable, it’s like the phonoxx plug of one device was plugged directly into those of the next in line. That gives the sound some of its absence of noise, but it also gives the sound some real speed of attack and release. Not to Odin 2 levels of transient speed, but not as far off as the difference in price might suggest. That particularly comes across with percussion instruments, especially things like chimes, triangles, and tubular bells – the kind of instrument where it’s all about the attack. ‘The full Allnic’ makes those percussive sounds behave like they were born to play in a hi-fi system. I thoroughly enjoyed my time playing with the Allnic cables. They are rewarding, and consistent enough to say universally so. The speed of attack and the silent backgrounds, alongside an intrinsic sense of getting out of the way of the rest of the system, are extremely satisfying and seductive properties. It’s hard not to be impressed with these Korean cables!